You haven’t seen England until you’ve seen its Heartland. 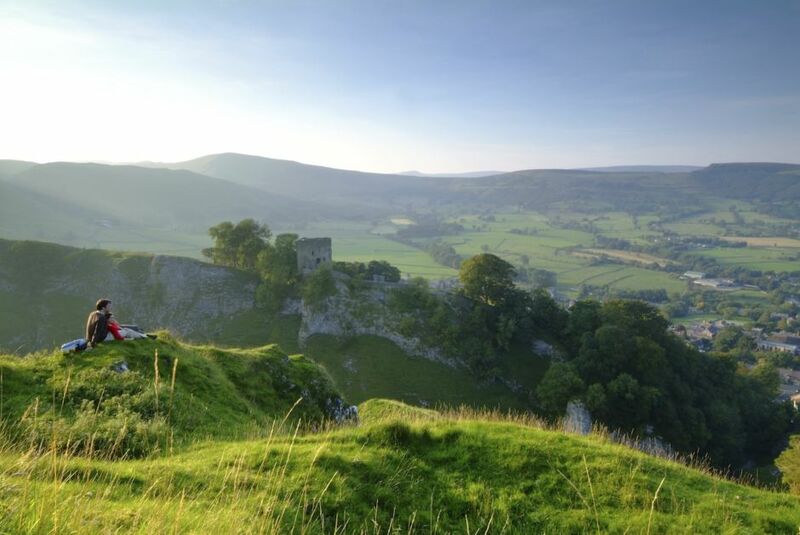 This is a region that’ll keep you busy sipping gin in dark parlors, trodding down cobblestones in the land of Shakespeare, and finding nature — both above ground and below — in England’s first national park. It’s where visitors can walk in the footsteps of gangsters, stumble on ancient burial grounds, and wander castle ruins. Just a matter of minutes beyond Birmingham Airport — your gateway to the Heartland — are dozens of adventures that will surprise you. Here’s nine to get you started. 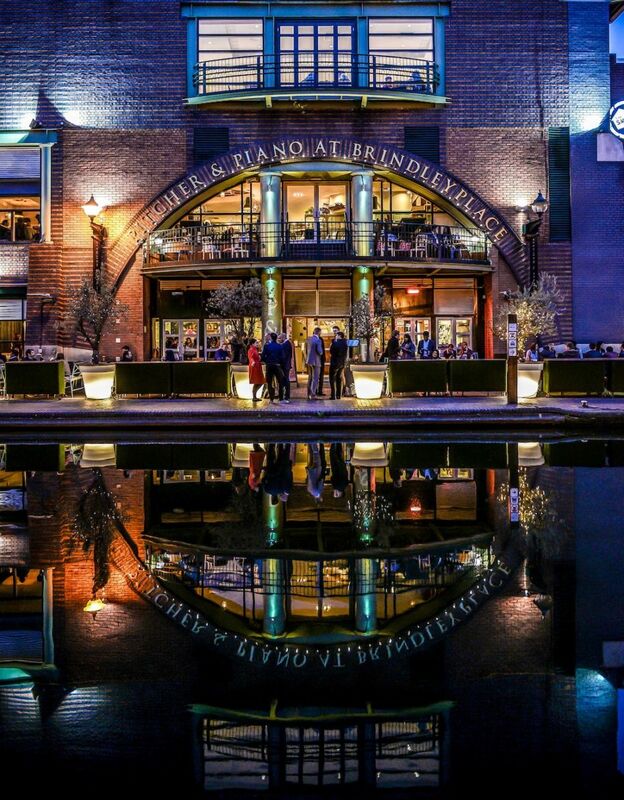 As England’s second-largest city, Birmingham is busy and buzzing no matter where you look. Art, music, architecture, food, nightlife — the obvious necessities are all there, but the more interesting things to see in town aren’t always as immediately visible, nor are they in most guidebooks. This is the unexpected side of Birmingham. Sure, you probably know that the BBC’s Peaky Blinders tells the story of a gang in post-WWI Birmingham, but what might be news to you is that it’s all based on reality. The Peaky Blinders were a criminal gang that ruled the city’s streets around the turn of the century, back in Birmingham’s rougher days. Even if you’ve never seen the show, you can bet touring the real-life sites of their crimes makes for one hell of a fascinating afternoon. The 3.5-hour tour is conducted by Professor Carl Chinn MBE, who also happens to be the city historian. He’ll take you around what was the underbelly of the city, pointing out the similarities and departures between the series and real life. To top things off, the tour ends with a traditional Victorian meal at The Old Crown — the oldest building in Birmingham, dating back to 1368. 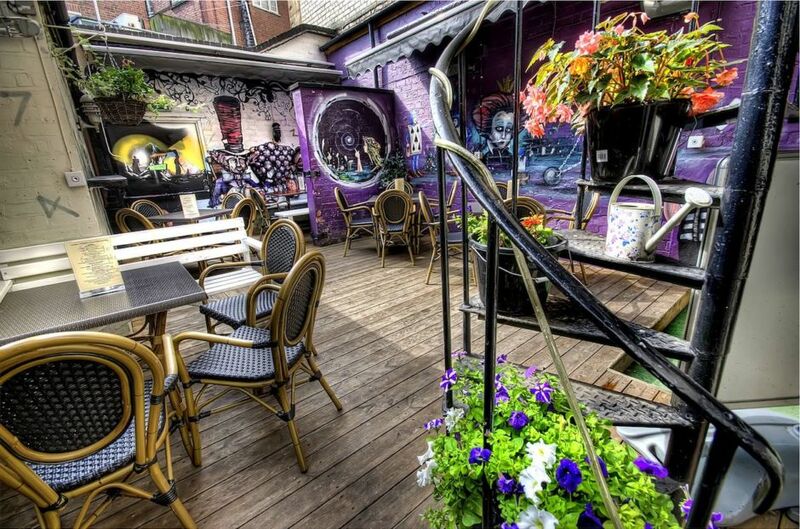 The Jekyll & Hyde (80 types of gin, hello) is a five-minute walk from Cathedral Square on an inconspicuous street. The building is purple — which you’d think would help it stand out — but is slim and tiny and easily missed. Keep your eyes peeled. The brightness of the exterior totally contrasts with what lies inside, where it’s ornate and elegantly furnished in ultra-Victorian, Dickensian style — especially upstairs, in the proper gin parlor. You’ll find sections with dark wood, blood-red draperies, and purple cushions along the walls. And glowing bottles of liquor, of course. They have an intimate courtyard in the back, too. It’s irregular in shape and enclosed on four sides by walls bearing graffiti inspired by Alice in Wonderland. The gin menu here might be rivaled only by the cocktail list, featuring drinks like “Fifty Shades” and “Lemon Bon Bon.” And if you’re feeling out of your league, they have afternoon tea and cocktail classes to boot. …Kind of. Start at Brindleyplace, right on the water, and start early. There’s a week’s worth of things to do just right here: Ikon Gallery (internationally renowned and free), the National SEA LIFE Centre, and The Crescent Theatre are the anchors, while you’ll also find tons of shops and restaurants, along with Symphony Hall next door. But then wander to the end of the canal and over to The Mailbox. It’s the old sorting office of the Royal Mail, populated now with designer hotels and boutiques and red-carpet restaurants (check out Marco Pierre White’s Steakhouse Bar & Grill on the 25th floor of “The Cube”). But even if your wallet is empty, make your way to level three and the BBC Birmingham’s Visitor Centre. Tours are available, but the best stuff is free — wander into their prop room (no need to call in advance), choose your costume, and get your picture taken with Doctor Who‘s TARDIS or a Dalek. They’ll also hook you up with the chance to take on a news or weather broadcast. Record it, and go home telling everyone you’re Birmingham Famous. Less than two hours from Birmingham, the Peak District is the United Kingdom’s first national park, established in 1951. Although you’re not going to find sharp-edged peaks here, as the name might suggest, you’ll definitely find diversity — the landscape changes drastically as river valleys narrow into limestone gorges before spilling out into green plains. The wind fluctuates greatly too, which can seem to create completely different views out of the same terrain. And the adventures? Just as varied as the landscape. The Ladybower Wood, in the Hope Valley, is a great spot to hike in the center-north of the district — it runs through one of the few remaining original upland oak woodlands in the area. Start from the bottom of the hills at the south end of Ladybower Reservoir and zigzag your way north. The best spots are up on top of the hills, overlooking the narrow reservoir running below, the woodland, and, farther toward the horizon, endless green fields. In spring, you’ll hear a regular orchestra of birdsong (quite a few species call the area home — look for cormorants and grey herons around the reservoir). In the late spring sun, this scenery takes on the best colors — watery gray, greens of every shade, and golden yellows and oranges. Enjoying the water itself (kayaking, canoeing, or boating) is definitely recommended, but since the waterways are private, you’ll need to contact a local outfitter for access. Okay, so you took the Peaky Blinders tour in Birmingham — are you ready for your next assignment? Head north out of the city for about and hour and a half (or less than an hour northwest from Derby) to the valley of Dovedale in the Peak District, and check out Casterne Hall. Recognize it? If you’re a fan of the show, you should know this location serves as the Shelby country house on screen. And though it doesn’t have gangster history, the story it does have is just as remarkable. For starters, it’s been in the current family for more than 500 years, and it stands on the remains of a Roman villa. There’s 21 rooms and a Georgian facade, making it practically a castle by American terms. On one of the outside walls, there’s a Roman arch. You know, just there. No big deal. Oh, England. You don’t have to surreptitiously wander around when no one’s home, either. The owners have turned the place into a B&B (yes, you can stay here), and they also offer tours, teas, lunches, dinners, and holiday events — but definitely book in advance, as these sell out regularly. You’ve seen nature from above — now it’s time to see nature from below. Turns out the Peak District is dotted with caves and caverns, some showing crystalline stalactites and the area’s famous semi-precious mineral, Blue John. For the most epic of formations, check out Treak Cliff Cavern and Blue John Cavern, both sitting just west of the Hope Valley. These two are the best for spotting interesting structures and tons of minerals — you’ll wander through rooms like “The Vortex” and “Aladdin’s Cave” — and they’re widely regarded as among the finest caverns in Western Europe. What’s more, this is definitely a view of England your friends back home haven’t seen. The thick and ancient Forest of Arden used to cover the area from the River Avon to the River Tame. While most of it is now gone — cut to fuel the engines of the Industrial Revolution — this famous forest setting for Shakespeare’s As You Like It is getting a second chance. The Heart of England Forest charity is busy replanting 30,000 acres with trees native to the area. The go-to spot here is the tiny Balsall Preceptory, established in the 12th century for the Knights Templar (after their work during the Crusades). The manor includes a chapel, the Church of St. Mary, and is still in use today. For a building that dates back nearly a millennium, the interior is surprisingly elegant, ornate, and colorful — with plenty of tiles and stained-glass windows. The church is in Temple Balsall, one of the oldest hamlets in the area. Don’t Google Henley-In-Arden — it won’t help you. Somehow this little spot roughly 20 miles south of Birmingham has avoided the limelight, even though its one-mile-long high street is totally medieval (and Henley ice cream is the stuff of legends). The 1,000-year-old thoroughfare is now lined with shops, boutiques, cafes, and restaurants — stop at The Nags Head for a pint or at Henley Ice Cream Parlour to break up your trip through time. The Market Cross (in the Old Market Place), the Guild Hall, St. John’s Church, and the Joseph Hardy House are a few of the best-known medieval spots, though around 150 buildings along High Street are protected due to their historical value. Imagine what it’s like standing somewhere for 1,100 years — that’s what Warwick Castle is busy doing. Widely regarded as one of the most well-preserved castles in the UK, it’s seen sieges, war, and fire, and withstood it all. The castle — minutes from Stratford-upon-Avon — regularly makes it onto lists that include the Tower of London and Stonehenge, so you know we’re talking serious business in the realm of English attractions. Tours will take you into the medieval vaults, and you’re also welcome to climb to the tip-top of the towers. The views over the River Avon and beyond are fantastic, but the exterior of the castle framed against and reflected on the water might be even better. If you come in summer, be sure to check out a jousting tournament, and definitely don’t leave before you’ve seen the world’s largest trebuchet launching a fireball. (Yes, that’s the technical term — it’s a giant catapult.) All this just goes to show, in England’s Heartland, you never know what to expect. 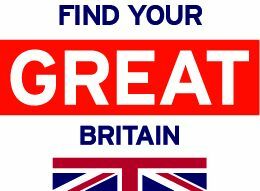 This post is proudly produced in partnership with VisitBritain, Visit Birmingham, Visit Peak District, and Shakespeare's England.